Columbia County Habitat for Humanity will he hosting a new art showcase in St. Helens, and anticipates hosting an open house in early February to show off the installation space. The Showcase Gallery will be housed inside Habitat's ReStore on Highway 30 and will provide a space for local artists and craftsmen to sell their work. The idea was developed when ReStore began receiving donated pieces of artwork, noted a press release from the nonprofit. "After receiving a number of beautiful pieces of art and hearing from artists that wanted to support our mission, it became clear that we needed a designated space to showcase high quality pieces," ReStore Manager Dave Marble stated in the release. The Habitat for Humanity-affiliated store secured grant funding through the Columbia County Cultural Coalition to pursue the project. The gallery space will feature bamboo flooring, which was set by Marble. 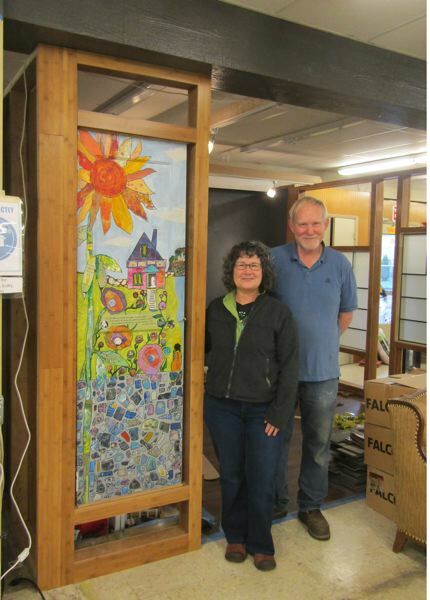 Volunteer Bill Blank and local artist Luanne Kreutzer also helped design the gallery space, including a glass collage on the doorway originally created for World Habitat Day last year, the release also states. Visitors to the gallery will be able to purchase pieces at prices determined by the artists when the work is donated. While the gallery concept is special to the ReStore model, the fit seemed natural for the store's volunteers and staff, many of whom are artists, the release added. The gallery will be hosting a grand opening on Saturday, Feb. 2 during regular business hours for Habitat's ReStore, which is open from 9 a.m. to 5 p.m., Tuesday to Saturday, and located at 164 Little St., St. Helens.